How Do You Spell Purpose? 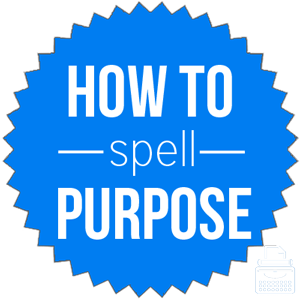 Home » Spelling Dictionary » How Do You Spell Purpose? Spelling of purpose: purpose is spelled p-u-r-p-o-s-e. Not to be confused with propose. Definition of purpose: Purpose is both a noun and a verb. As a noun, purpose refers to (1) a goal, aim, or object toward which one strives to achieve, and (2) resolution or determination. When used as a verb, purpose means to intend or resolve. When “-ly” is added to the end, the word becomes purposely and can be used as an adverb to modify adjectives and verbs. Pronunciation of purpose: purpose is pronounced per-pes. What does purpose mean? The word purpose is usually used as a noun to indicate a particular goal, object or reason, and can, therefore, be used as the subject or object of a sentence. It can also express intention. The purpose of this group activity is to develop teamwork skills. Tom apologized even though he didn’t do it on purpose. It also functions as a verb, though rarely. When being used as an adverb, purposely explains that someone did a particular action that was planned or intentional. I do not think he withheld the information purposely to prevent you from buying the property. There are some phrases and idioms that use “purpose” in a variety of ways. On purpose: Used to express when someone did something intentionally or deliberately. To good purpose: When someone does something that ends with good results. To little/no purpose: When something is done with no result, no effect, and for no reason; pointlessly. According to Merriam Webster’s, the first known use of the word was in the 14th century. It is from the Middle English word purpos, from the Anglo-French purposer meaning to intend, propose. This word comes from the Latin word proponere, which means to propose. There are several synonyms for purpose when it’s used as either a noun or verb. However, some of the synonyms do not necessarily mean exactly the same thing, so be sure to choose the right word to convey the proper meaning given the context. Purpose functions as a noun most of the time, though it is also used as a verb occasionally. Purpose expresses intention, a deliberate act, reason or goal. Be careful not to confuse it with the word propose.